The bee population in our cities is declining at an alarming rate. One should not go by their small size as they do a lot of work than we can ever imagine, and one of them is helping us preserve our fragile ecosystem. Here is one such organization – the Mumbai Bees an Urban Beekeeping initiative of Under The Mango Tree that is working very hard to bring back the bee population in our cities. We caught up with Mumbai Bees to find out why bees are so important and what we can do to save them and in turn save our planet! Under the Mango Tree takes pride in being a social enterprise with the aim of promoting beekeeping with the indigenous bee Apis cerana indica to increase agricultural productivity and incomes of marginal farmers in India, which in turn will help to improve their livelihoods. Under the Mango Tree boasts of having trained more than 1500 marginal farmers from Gujarat and Maharashtra in beekeeping over the past 2 years, and has market access for the honey produced for another 1500. The main reason the team at Under the Mango Tree took up urban beekeeping is to encourage increased education and awareness about the importance of honeybees, pollination, and urban biodiversity and sadly, there is a huge gap in Mumbai residents’ knowledge about these issues feels Sujana. Why do we need to protect our Bees? “BEES ARE SO IMPORTANT,” exclaims Gurushabd Khalsa, the urban beekeeping coordinator, while the list is endless, she points out some of the important reasons why we should protect our bees. 1) Four out of five foods we eat – pulses, oil-seeds, fruits and veggies – require a natural pollinator such as bees, butterflies for their reproduction. 2) Honeybees are THE MOST prolific and abundant pollinators, approx. 70% of all flowering plants rely on bees specifically to reproduce. Imagine a world without 70% of flowers? 3) Pollinators the world over is on the decline – their numbers are dwindling both in cities and rural areas. She adds, that one should go through the study by the UN Environment Programme – titled ‘UNEP Emerging Issues’ to gain a greater insight. Presently, the team works mainly with the indigenous Indian honeybee Apis cerana indica, which is primarily found in India but dwindling in numbers at an alarming rate. Under the Mango Tree is therefore, constantly checking to make sure the bees are healthy and doing what they naturally do well in their natural surroundings. All these workshops are conducted by Atar Singh, a Beekeeping Expert from Dehradun who is associated with Under the Mango Tree who also helps train farmers in beekeeping as well. 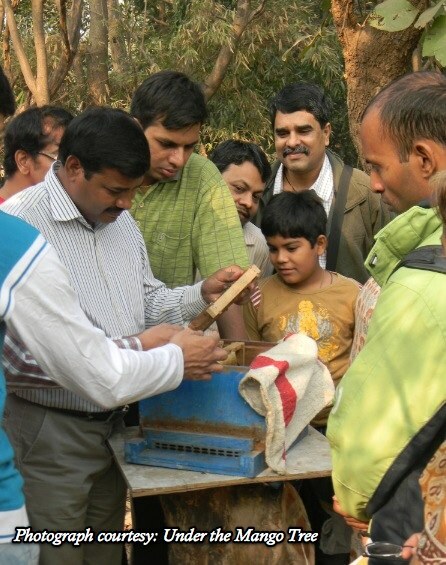 The entire Urban Beekeeping course will run across 9 months especially during the beekeeping seasons, from October 2011-June 2012.These trainings will be held in Maharashtra Nature Park at Dharavi and the registration cost of the training program is Rs. 6,500 which includes introduction to basic training weekend, 8 monthly seasonal skill workshops and training manual. The basic beekeeping starter kit cost (which is optional) is worth Rs 4,560, which includes 2 bee boxes, 1 bee colony, 1 bee veil, 1 swarm bag, 4 wax sheets. And in the worst case scenario, if you don’t have a suitable private space, you can contact Maharashtra Nature Park (Dharavi) and BNHS-CEC (Goregaon) who offer trainees space to keep their bees in the park! In a city that is struck by glamour and glitz, will something as sensitive as Urban Beekeeping be as popular? The answer is maybe. This most certainly poses a challenge to the team and the only way that they can promote Urban Beekeeping is by regularly hosting Urban Beekeeping Orientation Workshops, and a ‘Bee Walk’ in Maharashtra Nature Park, public events to increase the awareness about urban pollinators (bee walks, movie screenings, children’s events, hive visits – the works! We invite NGOs, social enterprises, individuals and groups who’re into such similar Bee Keeping/ Nature Conservation activities in your locality to write to us to share your story with our readers. Send us an email to tanya@tanyamunshi.com with all your details about your organisation/ personal efforts – we look forward to hearing from you. I am Mr.Mohan lal From Haryana. i have at this time 200 bee box. i am wanted to knowledge that in maharastra bee’s session how much month taking..can i migrate my bees in your state.plz help my and guide about maharastra beekeeper. i am wanted to take bees busines on top . Thank you for your interest in beekeeping. Under The Mango Tree runs on a project basis in rural areas, while the urban beekeeping program is restricted to Mumbai only. We are in the process of formulating a model to assist individuals in doing beekeeping. When it is finalized in the next few months, we will let you know. Please send in queries to utmt.in@gmail.com. Hi, I am from Bangalore. I am new urban bee keeper with 5 boxes of Cerenna. I still feel I require short course on bee keeping in Bangalore. Please suggest. Alok Thakur: I too looking for beekeeping in bangalore, call me at 9566323803 to discuss. Hi, i am based in bangalore. I am intersted to start bee keeping in my roof top. Can you help me. Is there any training sessions conducted in bangalore. please send me details to contact to set up an apiary in Urban settings in Whitefield Bangalore .